Annual semiconductor unit shipments (integrated circuits and opto-sensor-discretes, or O-S-D, devices) are expected to grow 9% in 2018 and top one trillion units for the first time, based on data presented in the new, 2018 edition of IC Insights’ McClean Report—A Complete Analysis and Forecast of the Integrated Circuit Industry (Figure 1). For 2018, semiconductor unit shipments are forecast to climb to 1,075.1 billion, which equates to 9% growth for the year. Starting in 1978 with 32.6 billion units and going through 2018, the compound annual growth rate for semiconductor units is forecast to be 9.1%, a solid growth figure over the 40 year span. The percentage split of total semiconductor shipments is forecast to remain weighted toward O-S-D devices. In 2018, O-S-D devices are forecast to account for 70% of total semiconductor units compared to 30% for ICs. 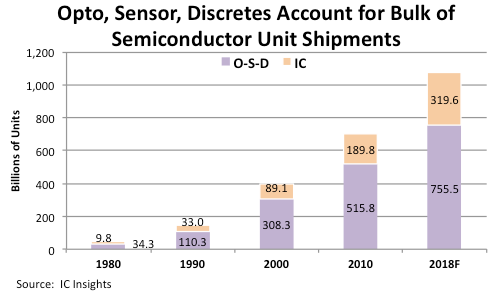 Thirty-eight years ago in 1980, O-S-D devices accounted for 78% of semiconductor units and ICs represented 22% (Figure 2). Semiconductor products forecast to have the strongest unit growth rates in 2018 are those that are essential building-block components in smartphones, automotive electronics systems, and within systems that are helping to build out of Internet of Things. Some of the fast-growing IC unit categories for 2018 include Industrial/Other—Application-Specific Analog (26% increase); Consumer—Special Purpose Logic (22% growth); Industrial/Other—Special Purpose Logic, (22%); 32-bit MCUs (21%); Wireless Communication—Application-Specific Analog (18%); and Auto—Application-Specific Analog (17%). Among O-S-D devices, CCDs and CMOS image sensors, laser transmitters, and every type of sensor product (magnetic, acceleration and yaw, pressure, and other sensors) are expected to enjoy double-digit unit growth this year.